What are Micrografts and Minigrafts? Micrografts were larger than today's follicular units. Minigrafts and micrografts both refer to a piece of hair-bearing tissue that has been specially prepared for a hair transplant. These grafts must be inserted directly into premade incisions, called recipient sites. Micrografts and minigrafts both reflect the same type of procedure as both are created during strip surgery. If a stereoscopic microscope is not being used to prepare the grafts from the excised donor strip then they are by definition referred to as minigrafts or micrografts.. 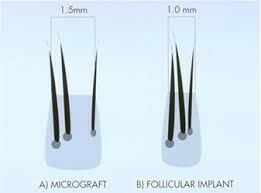 However, minigrafts and micrografts fell out of style in the early to middle 2000's with the onset of better hair restoration equipment and techniques such as follicular unit strip surgery (FUSS) and, subsequently, follicular unit extraction (FUE). 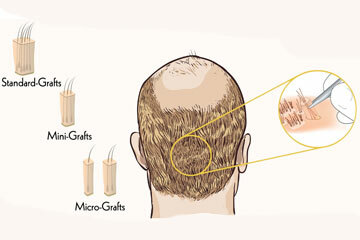 Minigrafts typically contain multiple follicular units and in total three to ten hairs (according to a 1997 synopsis) while micrografts only contain one to two hairs. As a result, minigrafts provide a stronger degree of coverage and volume. Micrografts, however, were best used to recreate the hairline. If a hair clinic chooses to use minigrafts today, it is usually in combination with a more modern technique but this is not always the case and in fact is quite rare for a number of reasons. Micrografts and minigrafts were the next logical progression from hair plugs, which used a large 4 millimeter or 5 millimeter punch device to scoop out the donor hairs for transplantation. Micrografts, and even the larger minigrafts, were much smaller than hair plugs, which often left unsightly scars and other noticeable complications. Minigrafts and micrografts evolved into follicular units when the stereoscopic microscope was introduced into the field of hair restoration by Dr. Bobby Limmer from Austin, Texas. A 1997 study compares both mini-and-micro-grafts after observing ninety grafting sessions. Even though 10% of the patients experienced cysts, the study shows that the patients enjoyed a 97% satisfaction rate. This was nearly twenty years ago, however, and techniques have evolved considerably since then. Royan specialized clinics transplant and beauty Royan clinic Hair, skin and beauty specialized Royan Moo Salamat clinics with several big and equipped centers in our beloved country Iran and provision of international services in neighbor countries (Oman, Iraq, Kurdistan and …) utilizing the science of the day and the most advanced medical equipment approved by American FDA and European CE and the expert and experienced personnel with 24-hour free consultation is at your service. Shahrak Gharb: Fakhar Moqadam St.